Viking Books for Young Readers, 9780670785155, 40pp. Octopus loves living on the busy reef under the sea. From her cozy cave, she can see clown fish, and sea turtles, and little butterflies swimming by. She especially loves watching the seahorses having fun, wiggling and twirling. 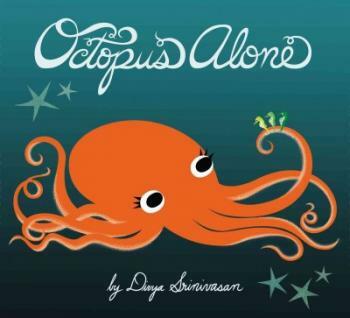 Sometimes she will play with them, but occasionally Octopus just wants to be alone, somewhere quiet, and not so busy. So one day, she swims far, far beyond the reef and finds another cozy cave, only here she is perfectly, wonderfully alone. It is exactly what she wanted . . . until she’s ready to go back home to be with her friends. As she did in Little Owl's Night, Divya Srinivasan shows children a wonderful part of the natural world in a very warm-hearted way. Divya Srinivasan (www.pupae.com) was born in Poughkeepsie, New York, but spent most of her childhood in California and then Texas. A talented animator, she has worked on films, music videos, and TV shows. Her first book was Little Owl's Night.